What’s better than watching the best of Prada, Salvatore Ferragamo, Marni and Fendi all in just one week? Runway looks are so important because they set the theme around the globe for the coming season. But what’s most interesting is actually how they are translated into our everyday wardrobe, also known as street style. Street style to me is runway turned reality. 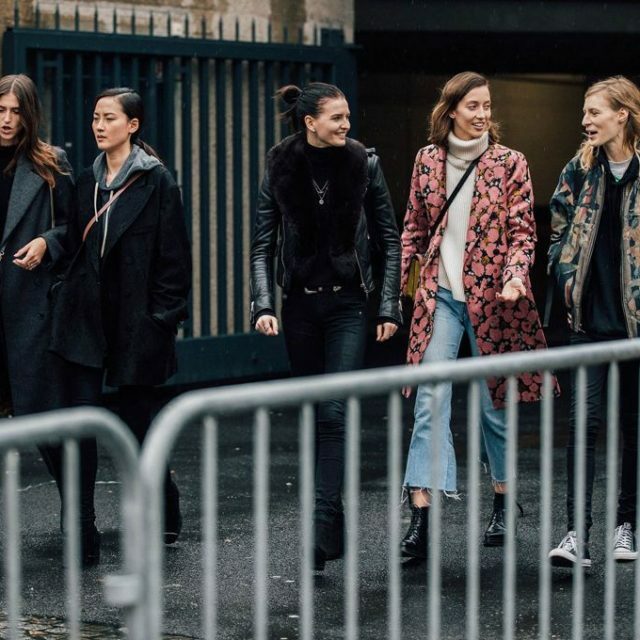 What these fashionistas wear to fashion week is probably what you will see on the street around you next season. Off shoulder necklines, cute preppy sweaters and stylish blazers which are a few of my favorite trends seem to be thankfully going strong. So are the use of bright color pants and hints of leather mixed with feminine pieces to add boldness to your look. 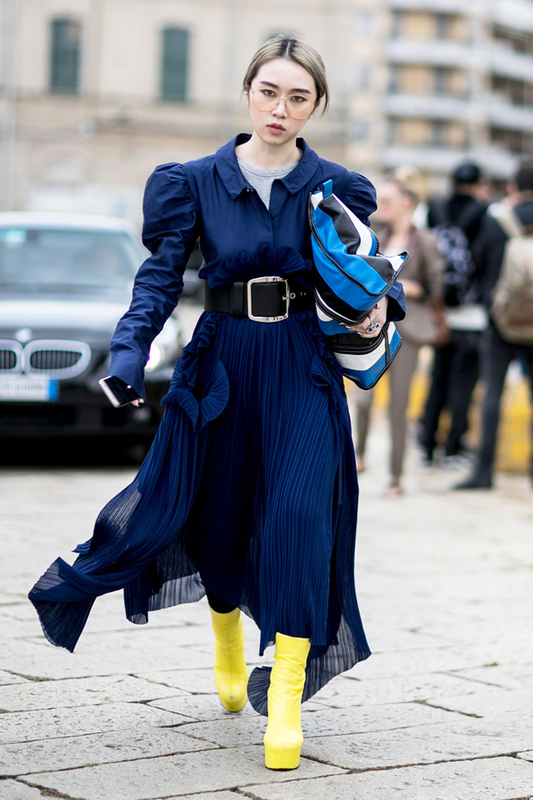 Get some fashion inspiration from a few of my favorite looks from the street at Milan Fashion Week. Who doesn’t love a feminine pleats dress. But in case you feel it’s too ‘girly’ for the occasion, balance the dress with show stopper boots and add structure simply by adding a belt. Update your black structured jumpsuit with unexpected elements; like this ‘reverse tuxedo’ look. Contrasting colors and textures work best together. Have your take on the 70’s using today’s contemporary cuts. Pair wide legged jeans (instead of 70’s style bootcuts) together with a printed blouse (instead of 70’s paisley shirts) and hoop earrings. Pull it all together with a belt and stylish heels. You will not look dated. Give some edge to a plain babydoll dress with killer heels and socks. It will also give an illusion of mile long legs. Freshen an off shoulder top with bright monochrome pants of a contrasting color. Finish the look with statement earrings to ornament your bare shoulders. Don’t be afraid to wear black leather for a day look by adding some softness to it. Mix a formal blazer with some fun fringe to keep it looking casual. Have some fun by trying different texture combinations and focus on this style contrast by keeping shoes and bag simple. Compliment a statement sweater with neutral color blocking pants and shoes. You can experiment with varying color combinations for the perfect look and make sure your outfit has a focal color theme by wearing two items of the same neutral color. Love their style, always the best.. not too much just in a simple way..